Sparking off communal tensions to divide the society has for long been the central agenda for extremists in different communities, and the lynching of a man by extremists on suspicion of beef consumption provided a perfect opportunity for that. The practice of throwing beef in temples to spark hatred between communities has been prevalent in many parts of India, and a recent post doing the rounds on social media claim to have exposed it. 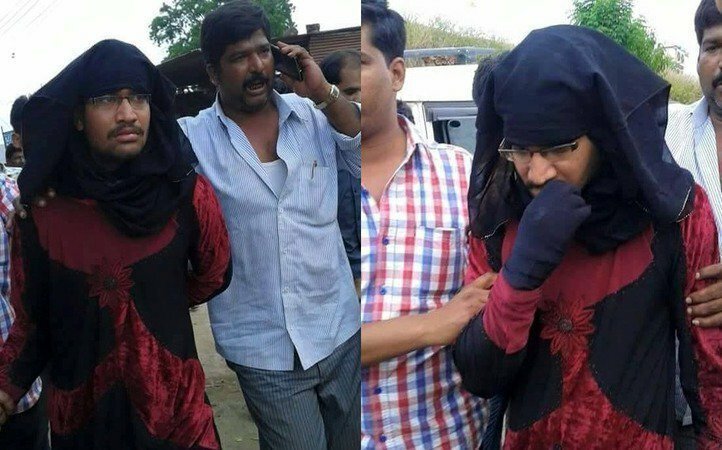 The post shows pictures of a man wearing a burka being paraded in Azamgarh, it is claimed that he is an RSS activists caught red handed while throwing beef in a temple. Although the authenticity of the claims is not yet known, this is clearly an attempt at stoking communal tensions by either side. The tweet which seems to be the origin of the post is not available anymore, but if the incident is true then it is a malicious effort by the RSS to spread hatred, and if not it is an equally shameful act by those spreading such rumours. Fortunately there have not been any undesirable responses to the controversy as peace has prevailed.